Though boxing gloves could be seen in a photo released of President Obama's lunch with Mitt Romney, aides joked there were no punches thrown, describing the encounter as "friendly." Updated at 3:30 p.m. ET: The winner of the presidential election met with the man he defeated Thursday as President Barack Obama had lunch at the White House with former Republican nominee Mitt Romney. Romney arrived at the White House shortly after noon. The lunch was closed to reporters but the White House issued a statement after the lunch saying that Romney "congratulated the President for the success of his campaign and wished him well over the coming four years. The focus of their discussion was on America's leadership in the world and the importance of maintaining that leadership position in the future. They pledged to stay in touch, particularly if opportunities to work together on shared interests arise in the future. Their lunch menu included white turkey chili and Southwestern grilled chicken salad." Romney left just before 2:00 p.m. without comment. Romney also went Thursday morning to a Washington hotel to meet for 90 minutes with his running mate, House Budget Committee chairman Paul Ryan, R-Wis., the first face-to-face meeting the two men have had since their defeat on Nov. 6. After the meeting, Ryan released a statement saying, "I remain grateful to Governor Romney for the honor of joining his ticket this fall, and I cherish our friendship. I'm proud of the principles and ideas we advanced during the campaign and the commitment we share to expanding opportunity and promoting economic security for American families." Four years ago, after Obama defeated Sen. John McCain, R-Ariz., he hosted a dinner for McCain on the night before he took the oath of office as president. At that dinner, Obama said that with the campaign and the balloting over, he and McCain shared a responsibility "to usher in a new season of cooperation built on those things we hold in common." Business leaders met with President Obama on Wednesday, and the mood among those CEOs was optimistic. Deloitte CEO Joe Echevarria discusses the meeting. Why was Wednesday, November 28, 2012 such a good day for House Speaker Boehner? What will Mitt Romney and the president talk about in their expected first meeting since the election? NBC News' Chuck Todd and the Washington Post's Jonathan Capehart join the conversation. He praised McCain for “a pure and deeply felt love of his country that comes from the painful knowledge of what life is like without it," he said, an allusion to McCain’s five years in a North Vietnamese prison after his Navy plane was shot down during the Vietnam War. In 2004, after President George W. Bush defeated Sen. John Kerry, D-Mass., the two rivals did not have a post-election face-to-face meeting, although Kerry, along with other senators, was on the platform at the Capitol at Bush’s inauguration for his second term. But Kerry made clear in his post-election words and actions that he was still resolutely opposed to Bush on policy matters, highlighting his vote against Bush's choice of Condoleezza Rice as secretary of state and calling for the resignation of then-Defense Secretary Donald Rumsfeld, for example. In 2000, in the aftermath of the five-week recount and Supreme Court battle that prolonged the presidential election, Bush met for 15 minutes with the man he defeated, Vice President Al Gore at Gore’s official residence at the Naval Observatory in Washington. When Gore greeted Bush outside the residence, reporters asked if the two men had any message for Americans. Gore replied, "I gave that Wednesday night," referring to his concession speech. In 1996, after President Clinton beat him, former Sen. Bob Dole went to the White House a few days before Christmas to chat with Clinton and exchange Christmas gifts. 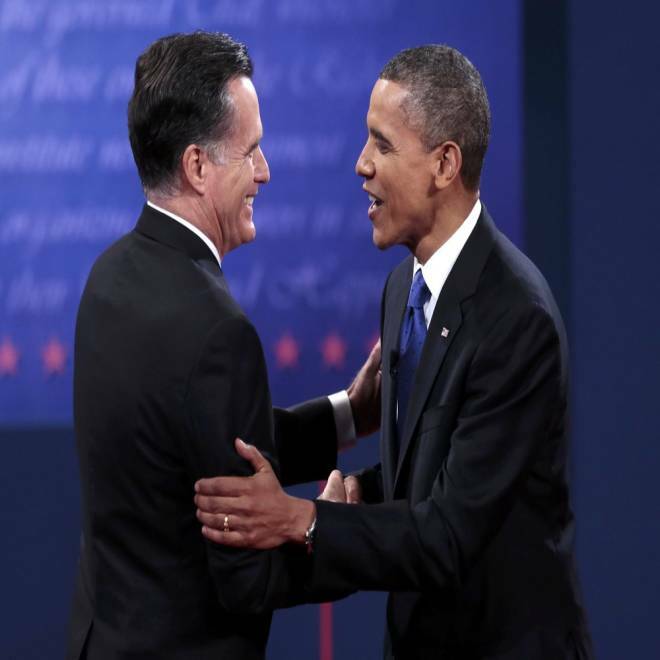 U.S. Republican presidential nominee Mitt Romney (L) and U.S. President Barack Obama shake hands at the conclusion of the final U.S. presidential debate in Boca Raton, Florida, October 22, 2012.